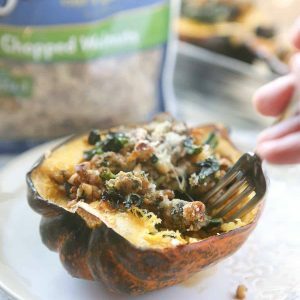 This Stuffed Acorn Squash recipe is filled with hearty ingredients like sausage, kale & walnuts. Makes a great dish for entertaining or healthy meal prep! Preheat oven to 425 degrees. Carefully cut each acorn squash into even halves and remove seeds with spoon. Place on baking sheet. Drizzle and brush with olive oil and sprinkle salt and pepper into each half and place in oven for 20 minutes. In a large nonstick skillet, brown Italian chicken or turkey sausage until cooked through about 7 minutes. Add kale and cook until wilted about 3-4 minutes. Stir in chopped walnuts and turn off heat. Spoon sausage, kale and walnut mixture into each acorn squash half. Top with freshly grated Parmesan cheese and bake for 10 minutes.